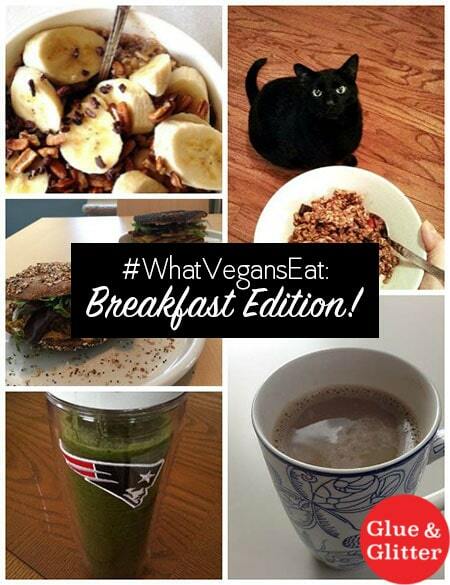 Check out what vegans eat for breakfast on a typical morning, including a somewhat shameful confession about my own breakfasts these days. Today’s post is part of a mini-series that I’m working on. I asked a few of my favorite vegan friends to snap pictures of what they’re eating on a typical day for breakfast, lunch, and supper. The idea is to dispel the myth that it’s hard to be vegan or that vegans have to eat expensive specialty foods. Over the next few weeks, I’m going to share my friend’s photos of what vegans eat at each meal on a real day. Let’s get to the pictures of food, y’all! As you can probably tell from her gorgeous photos, Annie is a fellow food blogger. I am in awe of her healthy recipes, her eye for design, and how she manages to juggle 1000 projects at once while still doing things like sending me a picture of her breakfast. What Annie ate for breakfast: Unless it’s Sunday (which is Waffle Day in our house), breakfast is always a variety of whole grains – oats, chia, hemp, teff – that I’ve soaked overnight along with dried fruit and lots of cinnamon. In the morning, all I have to do is add chopped nuts, cacao nibs, sliced bananas and zizz up a green smoothie in the blender and we’re fueled until lunch. Annie’s bio: Before escaping the mean city streets for the windy plains of Oklahoma, I was an administrative assistant and office manager at a subscription fulfillment company in Boulder, a think-tank in Santa Monica, a university in Cambridge, in the Green Zone in Baghdad, and at a non-profit in D.C.
Now I spend most of my time walking the fields, baking bread, stirring pots, writing, reading, trying to solve crossword puzzles (with a pen and a lot of Wite-Out), and blogging at An Unrefined Vegan and Virtual Vegan Potluck. I live in blissful satellite- and cable-free isolation with my husband, Kel, and our only son, Ike (part dachshund, part Labrador). My first cookbook, Crave Eat Heal: Plant-based, Whole Food Recipes to Satisfy Every Appetite is now available for pre-order with a release date in mid-April. My companion e-book, Crave.Eat.Heal.Outtakes. is available via blurb.com and iBooks. I first met Leigh when she was running Cosmo’s Vegan Shoppe here in Atlanta. Cosmo’s is sadly closed, but Leigh’s commitment to eating delicious vegan food (and raising the cutest vegan kid in town!) is going strong. What Leigh ate for breakfast: Wholesoy brand non-dairy yogurt topped with Love Crunch chocolate strawberry granola. 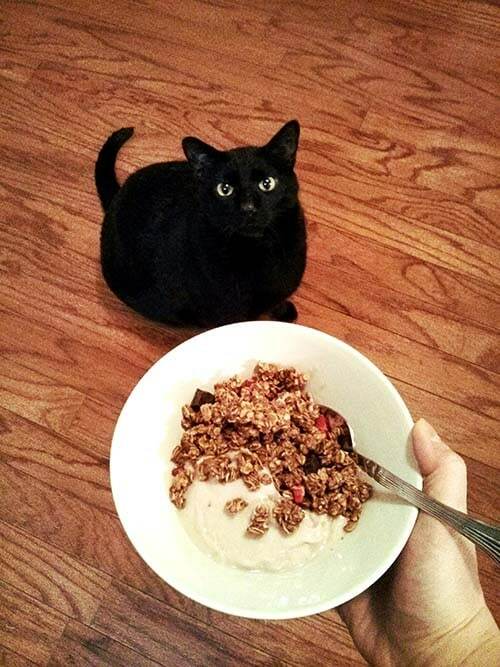 Kitty can’t have any. Leigh’s bio: Leigh has been vegan for the animals since 2001. She is a mom who works outside of the home, and rarely eats breakfast during daylight hours. Somehow she manages to find time to organize the Atlanta Veg Fest. www.atlantavegfest.com. Dianne is another one of my favorite vegan food bloggers. I strongly encourage you to read her super inspiring post, “Am I Vegan Enough?” I’m always impressed with how Dianne talks about tough vegan issues with a level head and so much grace. What Dianne ate for breakfast: I’m not a morning person but if I have enough energy, I like to make breakfast sandwiches. 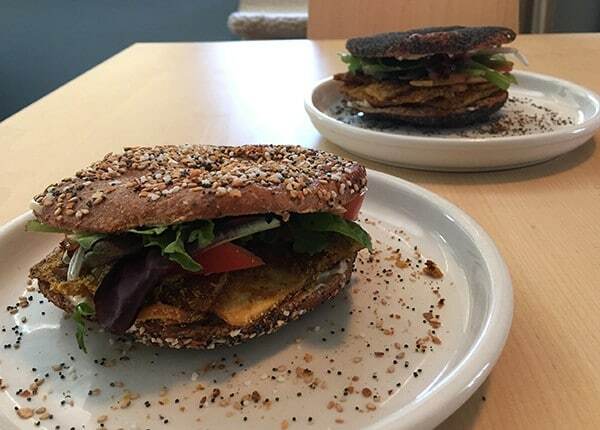 These sandwiches are on whole wheat flagels (flat bagels) and are loaded with fried tofu, lettuce and tomatoes. Dianne’s bio: Dianne Wenz is a Vegan Health and Lifestyle Coach, cooking class teacher, and the editor-in-chief of ChicVegan.com. She is passionate about guiding people to go vegan, as well as helping them improve their over-all health and wellbeing. 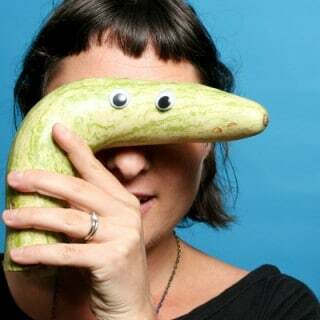 She runs Montclair Vegans, a MeetUp group in her New Jersey community, and can often be found hosting a potluck, whipping up a new recipe in the kitchen, or taking pictures of her lunch. To learn more, visit Dianne’s website: Dianne’s Vegan Kitchen. I met Ashley through the Virtual Vegan Potluck, and I’m so glad that I found her site! She’s a new vegan mom, like me, and I love how she shares real talk along with her awesome recipes. 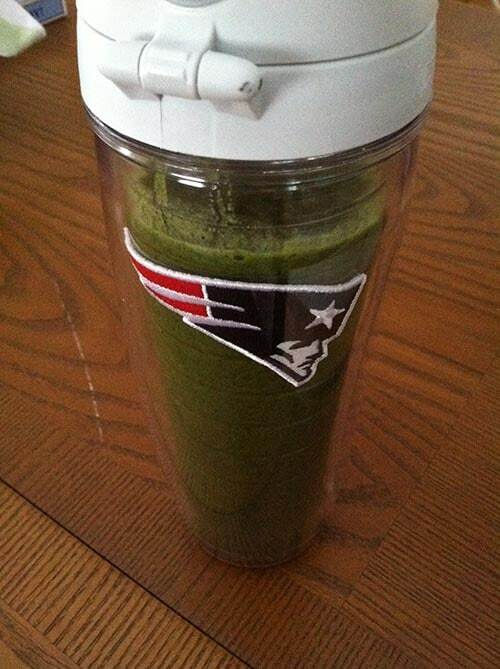 What Ashley ate for breakfast: Green smoothie made with a frozen banana, frozen mixed tropical fruit, fresh spinach, and a scoop of hemp protein powder. I drank this in Baby H’s nursery while he had some tummy time. Ashley’s bio: Ashley has been blogging about vegan cooking and eating adventures at A.Cook in the Making since 2008. She lives just outside of Boston with her husband, their infant son, and their ultra-sweet cat, Stewie. Cadry is another vegan food blogger that I met via the Virtual Vegan Potluck, and I’m so glad that I did. I love her common sense approach to vegan cooking and her beautiful food photography. But probably what I love most about Cadry is that we share an affinity for hoakey science fiction. 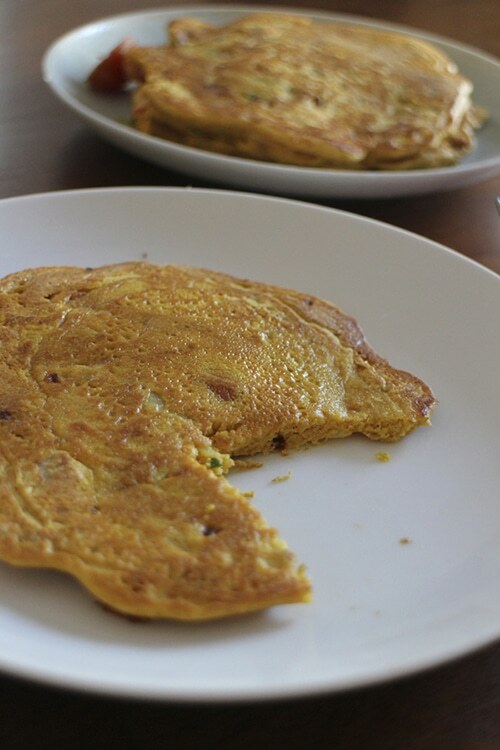 What Cadry ate for breakfast: For breakfast, this is a chickpea flour pancake. Unlike a blueberry or chocolate chip pancake, this one is entirely savory and stuffed with cilantro, onions, and tomatoes. The recipe is from the new vegan Ethiopian cookbook, Teff Love. Cadry’s bio: Hi, I’m Cadry, and you can see more of what I do (and eat) over on Cadry’s Kitchen. That’s where I share down-to-earth recipes, videos, travel stories, vegan insights, and more. When I’m not in the kitchen, I love traveling, hiking with my husband, and taking an absurdly large amount of cat pictures. Connect with me on Facebook, Twitter, Instagram, and Pinterest. You guys, it’s confession time: since having Darrol Henry, I have basically stopped eating breakfast. Darrol Henry has toast, oatmeal, or a green smoothie every morning, but for some reason, I can’t seem to get it together to eat something myself. It wasn’t on purpose, but that’s how it shook out. I’m writing this at 10am and am already thinking about what’s for lunch. Ack! 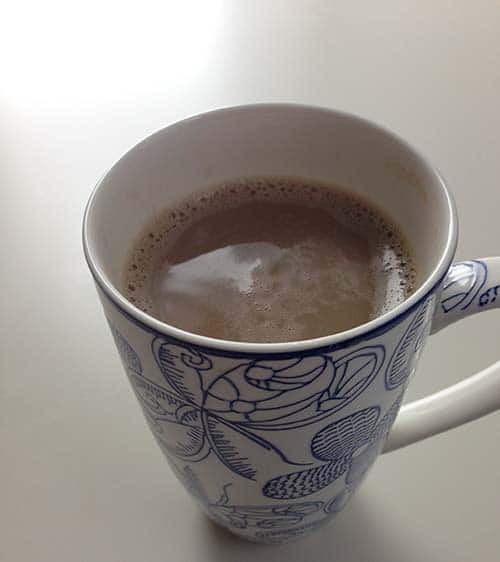 What I ate for breakfast: Coffee with soy milk. This is my first glorious cup from one morning last week. Usually, I have one cup while I get Darrol Henry ready for school, then two or three more while furiously working. It’s a bad habit. I miss my morning smoothies! We eat GOOD, don’t we?! Thanks for asking me to be a part of this, Becky – very fun! 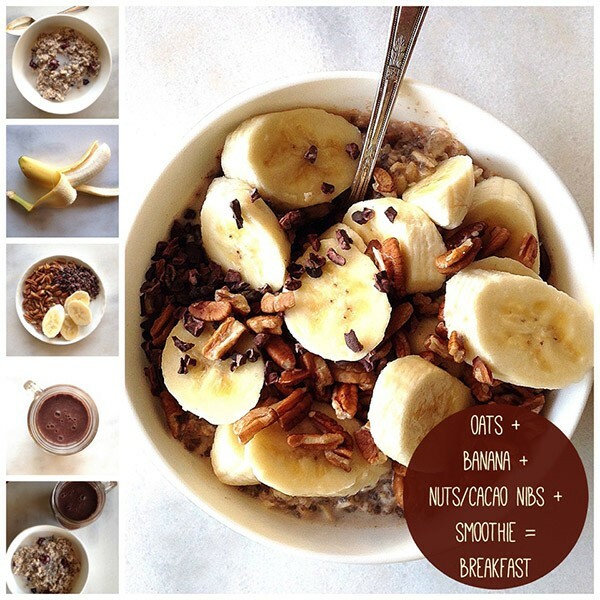 I love this idea, Becky–it’s so cool to see all of these different breakfasts together in one place! Cool idea! I love seeing what other vegans are eating! You are so welcome. Thank you for participating! Ha! I love it that your complete breakfast is a cup of coffee. Way to own it! 😀 Thanks for letting me take part in your series. It’s such a fun idea, and I look forward to seeing the future installments. Haha I will admit that confessing felt good. Thank you so much for taking part! I’m excited about this series!